A complete family of powerful learning tools designed to create modern CIM CELL technology for your classroom. 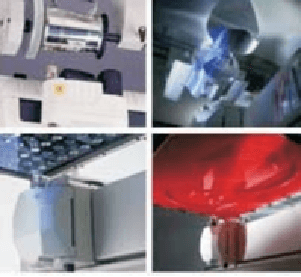 Hampden CIM Cell Systems are working scale versions of larger industrial systems, combining industry-leading hardware and innovative software products into complete laboratory size units. 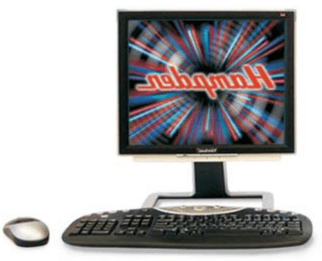 Hampden H-CSI-CS — Pentium based computer system is an American made system which has been selected, tested and set-up to perform to the high standards of use required for CIM-CELL performance. Hampden H-CAI-PO — Color inkjet printer. 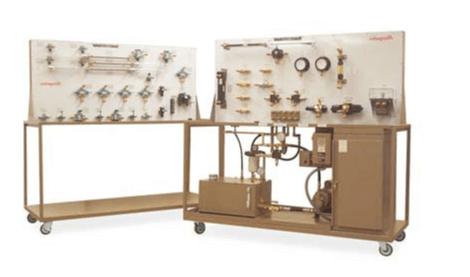 The Hampden CIM Cell Simulator-I consists of a scaled down industrial system, designed for industrial process control training using computer control. The following processing stations can be operated as stand alone training stations or can be combined with one or more additional training stations for more complex training. Operator System Level Control (PC control of machines). Operator Machine Level Control (Push buttons / Switches). The Robot: Selects the correct (Gripper) tool, sized material from storage, loads computerized engraving system, removes engraved work and places it at the drilling system, then removes the engraved and drilled work and places it on the product delivery system. The product delivery system delivers the product to the operator. Industry Leading Products & Hampden Engineering Means Real-World Experience for Your Students! 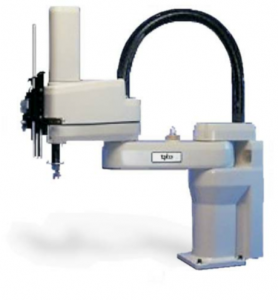 The Adept Cobra 600 is a “best-in-class”, four-axis, table-top mounted SCARA robot. Designed and developed in response to customer demand for increased reach, and combined with Adept’s easy-to-use software, this robot is an attractive solution for both fixed-automation and manual production. With an overall reach of 600 mm, and an increased Z-axis stroke to 210 mm, the Adept Cobra 600 has a maximum payload capability of 5.5 kg. The robot’s design is unsurpassed for high-speed, reliable, light payload assembly, handling, and packaging applications. The hollow Z axis quill provides a convenient passage for both pneumatic, and electrical user lines and has been strengthened for greater rigidity in case of collisions with peripheral equipment. Adept software and controllers further simplify integration of the robot by combining all of the functions found in a typical robot work cell including motion control, work cell communications, vision guidance, and conveyor tracking. Hampden’s CIM Cell Simulator-IV consists of a scaled down, computer controlled industrial system, designed for industrial process. 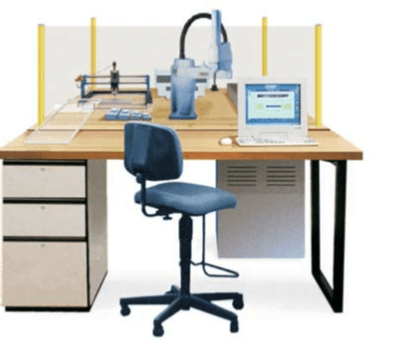 The following processing stations can be operated as stand alone training stations or can be combined with one or more additional training stations for more complex training. 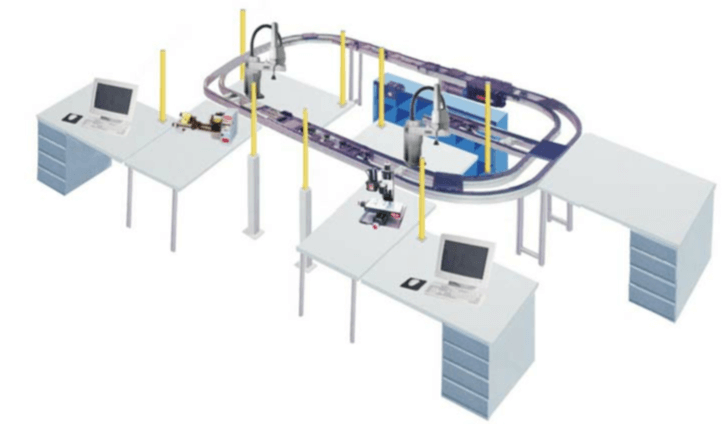 The Robot: Selects the correct (Gripper) tool, loads computerized work system(s) which performs an operation on the raw material, then removes the work and places it back into the conveyor system. The Conveyor system transports the material (product) from the AS/AR material storage system to the work systems and back to a material storage system. AdeptWindows PC Software gives you the ability to program virtual work cells using native AIM and V+. Execute programs in real-time to drive virtual robots and cell peripherals. Write, debug, and execute your application code without the physical robot or cell hardware and take your finished programs, without translation, to the actual robot system. Create virtual models of physically and kinematically accurate Adept mechanisms. The AdeptWindows controller automatically detects the virtual robot at start-up and loads the appropriate kinematics and configuration data. Exchange or swap existing items in a cell without the need to manually re-establish the component inter-dependencies (e.g. wiring, tooling, parts). Use a top-down design approach by modifying generic pre-modeled work cells. Re-position components and use SmartSWAP to quickly design a specific work cell. Simulate programs written in AIM & V+ via an Ethernet connection using the Adept Windows programming interface. Track parts using sensor interruption or continuous belt conveyors. Belt encoder values are passed from Adept Digital Work cell to the V+environment.